Mobile technology is the best option for salon professionals who are on the move all day. The same goes for many clients who are fitting in a salon visit after work or during lunch. For that reason, Web App Clouds software development company has launched the new Salon Clouds Plus app. The app creates a digital profile of each client and uses the data to increase retail sales, referrals and customer retention. It has a user friendly format that makes it easy for service providers and clients to connect. 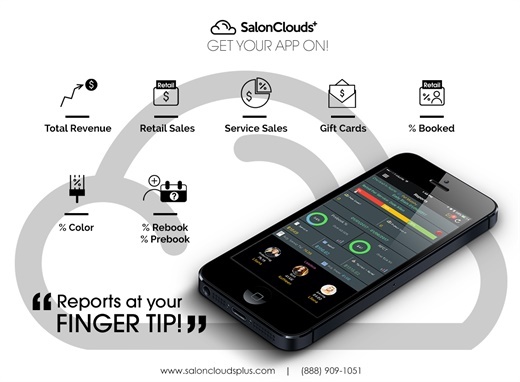 Salon Clouds Plus develops "custom" mobile apps for salons and spas that are ultimately downloaded by their customers from iTunes, Google Play and Amazon. The apps are integrated with many salon software companies, such as Salon Biz, Spa Biz, Millennium, STX Software and Salon Iris. With a sleek and responsive, client-friendly format, Salon Clouds Plus provides simple functionality geared towards boosting the revenue base of salons and spas. Web App Clouds also provides website development and digital marketing services. "I have been working with Salon Cloud for two years now and they have transformed our business with custom technology which integrates our various software platforms," says Philippe Ifergan of Charles Ifergan Salon in Chicago. "Thank you to the team at Salon Clouds Plus," says Kerry Hovland of Von Anthony Salon in Frisco, Texas. "With your help we have been honored as a Salon Today Top 200 in Technology once again." Visit saloncloudsplus.com for more information. As a salon marketing strategist and SEO expert, Dustin McCorchuk had a list of musts when it came to choosing a software management system for he and his wife Rachel's salon. Find out what functions were critical for him. Frederick CEO Corey Kossack offers some appointment-filling strategies to owners facing a summer sales slump. Shortcuts' Gabe Ormando uses research to prove that experiences make the most meaningful gifts, as well as some helpful strategies for designing a solid gift card program. Shag Spa and Salons' Natasha and Fred Klages explain how they've managed to get the scheduling down to a science. Recapture lost revenue by minimizing your no-shows. Rosy's Jim Bower shows you how to better communicate with clients to get them in the salon on time for their appointment. Millennium Systems International announces its recent partnership with Textel, a two-way texting service that allows salons and spas to text clients through their business line via any computer or mobile device. From information access to selfies, Shortcuts' Richard Wildey offers 8 ways to leverage technology to engage your young team members. Rosy Salon Software's Jim Bower offers the skinny on cloud-based software, and offers 10 benefits for considering it for your salon business. Rosy Software's Jim Bower is back with a blog full of top tips for building your own successful salon website. As part of Shortcuts' ongoing series on a good work/life balance, Clarissa Borg, partner in TONI&GUY Toronto, shares her secret to looking after her daughters and her business at the same time. Scott Blum, vice president of Total Merchant Services, teaches salon owners what to look for when considering a point-of-sale system.